The Zebra is a wild member of the horse family that can be found throughout sub-Saharan Africa. There are three species of Zebra – the Common or Plains Zebra that is found all over Eastern and Southern Africa. The Mountain Zebra that is separated into two races, the Cape Mountain Zebra and the Hartmann’s Mountain Zebra. Finally the Grevy’s Zebra is the largest and rarest of Zebras and is found in northern Kenya and southern Ethiopia. Zebras are large animals and often overcome attacks from Lions. When being chased by Lions the stallion goes to the back of the herd and violently kicks out behind him. This method often deters Lions, as they cannot risk injury or even death. 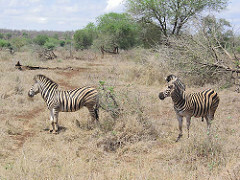 It is also believed that the Zebras stripes make it harder for Lions to see them, as Lions are partially colour-blind. The most common of the Zebra family that has the widest range of the three species. It is split into three different races that are shown below. Grant’s Zebra: southern Sudan, Kenya, Tanzania, Zambia and northern Zimbabwe. Chapman’s Zebra: Namibia, Angola and western South Africa. Burchell’s Zebra: South Africa, Botswana, Swaziland, Zimbabwe and Mozambique. The Common Zebra is very common throughout southern and eastern Africa and often forms mixed herds with Wildebeest. It lives in herds of up to 100, although normally these herds would number 15-20. It is a grazing animal and prefers open plains but can be found in bush thickets, woodland, wetland and semi-desert. The Mountain Zebra has a smaller range than the Common Zebra and is harder to find in its upland habitat. Although they are named Mountain Zebras they are not really found on mountains, their preferred habitat is high-altitude plains and hills. There are two sub-species of Mountain Zebra, the Hartmann’s Mountain Zebra and the Cape Mountain Zebra. Cape Mountain Zebra: western South Africa, Cape Province, northern Namibia. Hartmann’s Mountain Zebra: southern Angola, Botswana, Zimbabwe, Northern South Africa, Swaziland and southern Mozambique. Both sub-species are endangered although we were lucky enough to see them both on our holiday to South Africa in October 2004. Grevy’s Zebra are the largest and rarest of the three Zebra species. They have been over-hunted and persecuted for many years in east Africa. There are now as little as 3,000 remaining in the wild. They are a desert animal and are found in the scrub and aridlands of northern Kenya and southern Ethiopia. They used to be common in Somalia but became extinct there in 1973.